Why do we even know this guy's name? 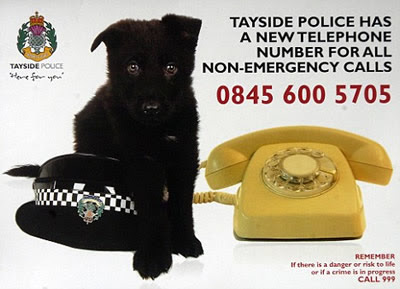 Tayside Police in Dundee, Scotland have apologized for not seeking the advice of the force's diversity advisor before introducing a ritually unclean animal in adverts for a new non-emergency phone number … proving that a manufactured supply of gratuitous sensitivities will always create a demand. One could throw a thousand stones or more in a crowd of Canadian Muslims before striking even just one who is outraged by a picture of a dog, but then our own diversity advisors and human rights commissions have only recently begun to prevail upon Muslims to posture for them. 1. Police in England feel the need to apologize for this ad. 2. School children in the UK are forced to pray to a Muslim deity; those who refuse are punished. 3. Sharia law has been embraced by the most senior judge in England. Churchill must be spinning in his grave. What a bloody hopeless country. July 04, 2008 3:41 p.m.
July 09, 2008 11:10 a.m.